I am a raccoon. Agender, asexual, panromantic. They/them. Amateur programmer. I&apos;m doing my best. Tail: Raccoon tails are not actually that big or useful. Thus, having a high tail stat means defiance of natural tendency for the sake of expressiveness. The furryness stat. Soft: How soft and cuddly you are. 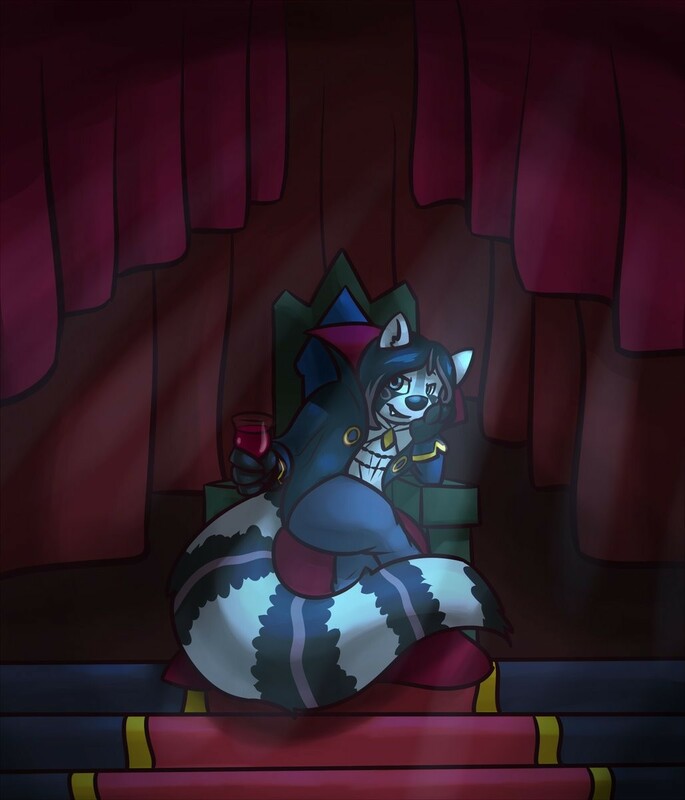 Raccoons are actually quite affectionate around those they&apos;re comfortable with, so being good and comfy to nuzzle into is paramount. Thievery: One&apos;s ability to make off with things, whether by stealth, cuteness, surprise, or the general weirdness of a raccoon encounter. Washing: One&apos;s ability to clean things with one&apos;s weird little hands. 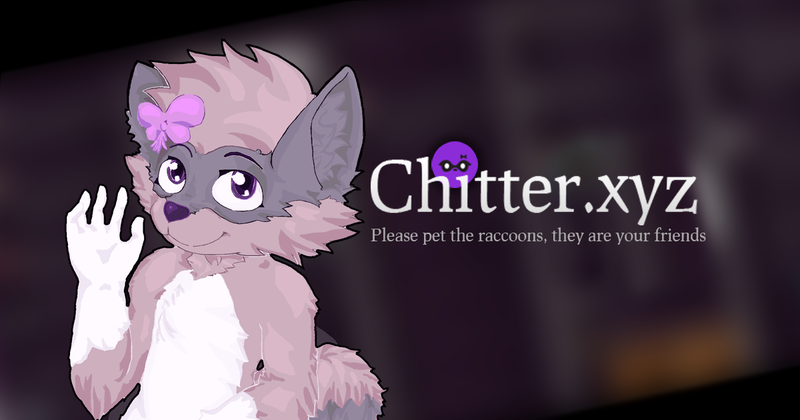 Chittering: One&apos;s propensity to make cute little animal sounds when happy. Mask: Mysteriousness. The mask represents the unknowable, the mystical. The allure of the raccoon. Hi. 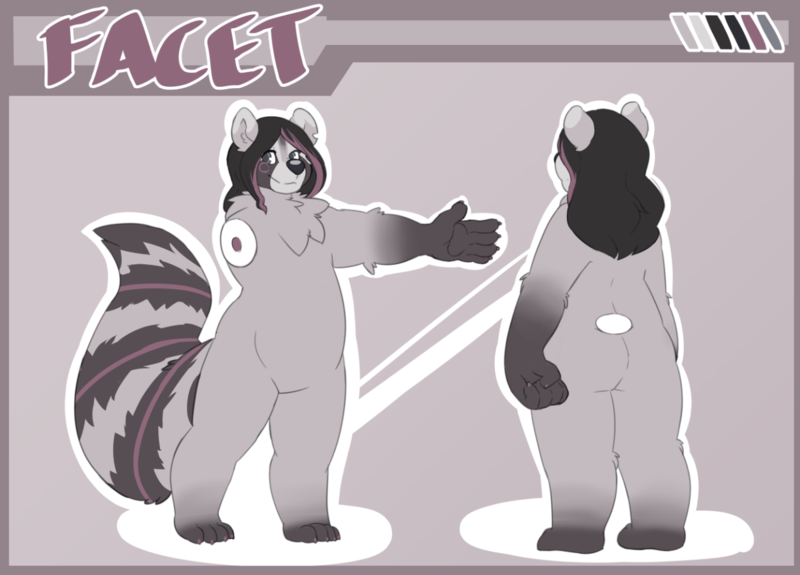 My name is Facet, and I&apos;m a raccoon. I&apos;m a little bit of a private person, but always willing to meet new people. I try to promote honest positivity whenever I can; I don&apos;t always succeed, but I try. I&apos;m a kinda-sorta game developer, and a Twitch streamer. 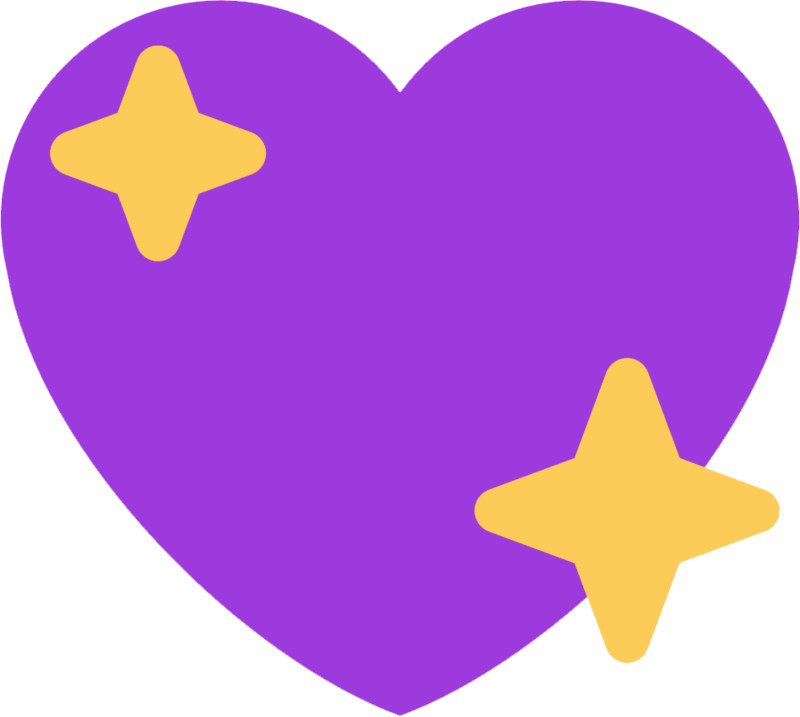 I don&apos;t stream to make a brand or audience really, I just like fostering a relaxing space and enjoying games with people. Continuing Final Fantasy Adventure. Maybe I can finish tonight, but I&apos;m not sure. Will I get caught in a "but I&apos;m almost there" loop and go an extra few hours like I did with the last game? Who knows! I like helping people, when I can. It&apos;s hard, to find the energy to really do it, but especially when people approach me, I&apos;m always happy to lend the support I can. It&apos;s also kind of the problem, though. I can&apos;t really reach out to people as well or as often as I want, and I can&apos;t expect people to come to me of all people, out of everyone. But you know, I&apos;m trying. I just hope for it to amount to something for people. This was basically a picture of my own self. The things I aim to do with myself. I invite people that are lost, cold, losing on hope and things, and I take them in, treat them well, give them some aspect of warmth and direction, so that they can keep going through this harsh phase. It&apos;s... Kind of a grandiose vision of things, but it got me to thinking about the way I conduct myself, within the limits of how I can. The other day, I was talking about Minecraft, and about how the last time I played, I just made this big inn/lodge in the middle of the tundra, and how it was just, this little cozy beacon in the middle of nowhere, with a nice fire, and beds, and fresh baked goods and travel supplies to see people on their way, and directions to neighboring biomes and stuff, and well, it got me to realize something. Aaaaand I&apos;m back again! Today I&apos;m cracking into Final Fantasy Adventure, the starting place of the Mana series. I&apos;ve never gotten terribly far into it, but I&apos;m hopeful it&apos;ll be a good time! Mood: Wanting to say something nice and cheery and affirming in a general sense, but not really knowing how to say something like that, and hoping an indirect explanation of this feeling can suffice. Moving right along into the second game for my SaGa of Mana event, which is the rather lovely Final Fantasy Legend II, one of my first major formative RPGs. Which as we&apos;re used to hearing, I never even knew was linked to a continuing series until much later in life. Let&apos;s see how we do! Lately I&apos;ve been a bit enamored with the idea of a metroidvania that doesn&apos;t use its system of giving you upgrades as a way to gate you off into a specific order of areas to clear. Where you can go to any areas you want and find access upgrades in them, that instead of hard-gating other areas, just give you new routes to link between them, let you find spots in different areas for secrets. And let the final area be gated by beating all/enough of the bosses or something. Should I make an obligatory poll to make use of the new feature? Continuing with The Final Fantasy Legend, in what I&apos;ll be referring to as SaGa of Mana, and endeavor to play as many of the SaGa series and Mana series games as I can. I&apos;m hoping it&apos;ll be something special. It makes it hard for me to really grasp how to approach people, in a broader sense. I spend a lot of time trying to find things to connect to people through, but it&apos;s always through this weird filter of things that I like in certain ways, and I think a lot of times the message I mean to send is completely lost. It&apos;s to the point where I have a bit of a hard time understanding and expressing my preferences at all, or enjoying gifts and recommendations that align with things I like. A part of my brain just jumps straight to "oh good, it&apos;s another <thing>" without really processing the sentiment or whether I actually enjoy that thing. You know, I think I might have, at some point, become generally desensitized to the concept of "getting a simple gift that aligns with things I&apos;m known to like." I guess it comes from the idea of my mother bombarding me with things that she got an impression I liked, leaving me with like, a swarm of things that are green because she thought I liked everything to be green, because I mentioned liking it as a color at a point, and stuff. I feel good about today, I think. Trying to get back into the swing of some things. There&apos;s a lot more I should be striving to add to my daily activities, though. It&apos;s been a while since I did one of these, but tonight I&apos;m gonna be starting a new project. The SaGa series, and the Mana series, interwoven by release date, for as many installments as I can reasonably access. This is gonna be the start of the rest of the year, basically. I did the bare minimum to be able to say I did something today (cleaned windows and did laundry,) and I feel lazy for not doing more. If I did that much every day it wouldn&apos;t be so bad. Might even be able to say I did as much as I could because that&apos;s all there was to do. I dunno. I&apos;ve been making a lot of strides on important things lately, but it&apos;s hard to feel like it&apos;s enough. There&apos;s still so much more I&apos;ve let pile up. Remember when I was actually around, and actually did things with people? If your general chat channel is just named "general" and is in no category or a category called something generic, I have no idea which server notifications coming from that channel are actually coming from and it&apos;s very annoying. Equal parts Discord&apos;s fault for not showing which server it&apos;s from in the notification, and Discord&apos;s fault for promoting the concept of a standard name for a generic discussion channel. Most of the others are still good games in their own rights, and SotN does have a lot of questionable decisions, I&apos;m not saying it&apos;s a necessarily better or worse game. It&apos;s just, none of them really produce the same feeling from me. While I&apos;m not saying anything about how inherently good or bad the game is, there&apos;s something about Symphony of the Night that&apos;s inherently impossible to capture in any other game that&apos;s spawned from it. Not the content, or the mystique of its secrets, or anything like that. But just, some sort of feeling to its atmosphere and energy is something I never have and never will feel again. Aria of Sorrow is probably the closest to it, though.